… this dispute is ultimately not about whether Amazon is a monopolist or monopsonist. Nor is it about whether Amazon is trying to use books as a loss leader to sell other merchandise or whether the company is treating Hachette, authors or its own customers fairly. It is also not about whether book publishers as currently configured are an essential bedrock of our society. Sherman goes on to to say this means authors will be fundamentally questioning what value a traditional publisher offers—which, of course, is exactly what’s happening. You can’t attend a writing conference any more without hearing this question at every agent and editor panel. Read the full piece. I suspect a publisher’s value may greatly depend on the genre/category in question, and how much consumer recognition the publisher’s brand has. I once wrote a long piece about the future of the author-publisher relationship (sadly, no longer available online, though I discuss here). I speculated that marketing would be the key value, but in the literary world, editorial taste and prestige is of much higher consideration. What do you think? The New York Times recently released a stunning visualization of job growth and decline in the U.S., based on government data. Below is a snapshot of the publishing/media environment. 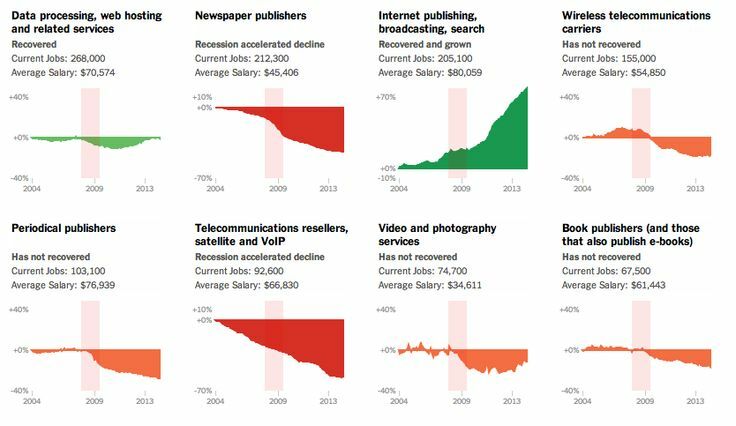 Newspaper, magazine, and book publishing jobs have declined while internet-related publishing jobs have grown. I’m not sure how much the recession is really related to the declines seen here (as opposed to other fields the Times covered). Technological disruption of the market is obviously a big factor—perhaps the recession sped up the decline? It’s tough to envision a job recovery for either newspaper or periodical publishers. What do you think? This is a practical post, with transparent data, about one author’s sales after leaving Amazon KDP Select. The Select program demands that self-publishing authors sell exclusively through Amazon for 90 days; in return, Amazon gives you 5 days out of the 90 to make your book available for free (among a few other perks). I’ve found that having books out of Select is (so far) having a positive effect. With KDP Select free days, I can drum up $1,500+ of extra cash in a 48-hour period, but that’s relying almost entirely on Bookbub, and things go back to normal almost immediately. … With books up on other vendors and a permafree [permanently free] title to keep readers coming in, I’m seeing much more consistent results. … Another ancillary benefit of permafree is email signups. With a link to my New Releases newsletter in the front and back of my book, I’m getting a lot of clicks – and a lot of signups. An extra 70 or 80 per day at the moment, which adds up pretty fast. It’s getting to the point where I can sell 50 – 100 books at full price from each email (once or twice per month), which also helps keep things going. It feels like the tide is turning against the Select program, which makes me wonder what Amazon might do to increase its attractiveness. Indie authors have long wanted the ability to pre-order through Amazon (all the other retailers offer this functionality for self-pub titles), so perhaps that will be the next carrot. What do you think? Very timely post for me, on the point of considering KDP Select but pausing on the brink. Since all my baskets prove to have holes very reluctant to commit all to one.